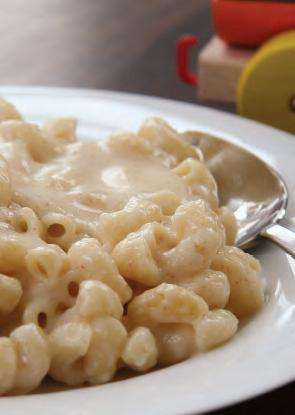 Macaroni & Cheese – – Oil, Whole Wheat Flour, Milk, Chicken Stock (chicken or vegetable stock), Cheddar Cheese (grated cheese such as mild cheddar), Macaroni (cooked pasta (elbow macaroni, alphabet pasta)), – Heat oil in a saucepan over medium-high heat. Add flour and cook 2 minutes. Gradually pour in milk and stock, and simmer until the sauce thickens, about 5 minutes. (You may have to remove from heat.) Gently stir in grated cheese. Pour sauce over the cooked pasta.